Two days before Halloween, extremely high winds racked Rome to the point that public schools were closed. I walked briskly through the cobblestone streets of Trastevere, pivoting at the school, then the plumbago and so forth, picking my way through the labyrinth. Everyone hurried about, hoping to avoid being caught in the next rain burst. 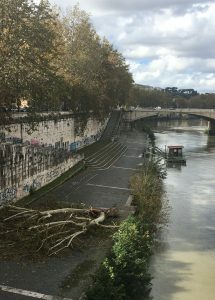 Coming to the bridge to Isola Tiburina/Tiber Island, I noticed a very large portion of a sycamore laying smashed on the concrete river embankment, far below. My thin plastic rain poncho buffetted me slapping against me furiously. I stopped to remove it, packing it into “Quasimodo,” as I affectionately call my backpack. I cut across the island, through the Porta d’Ottavia and – after a few blocks – arrived at the studio. I worked for the next several hours, fortified by a pranzo/lunch of a tramezzini/triangular sandwich, caffè, and a few biscotti cioccolati. I listened to the wind howl outside, then a torrential, thunderstorm swept through and eventually cleared. Several excited young children celebrated by shouting and running about gleefully. Our trio had tickets to go see Nureyev at 8pm at Cinema Farnese, and we were keen to be on time. 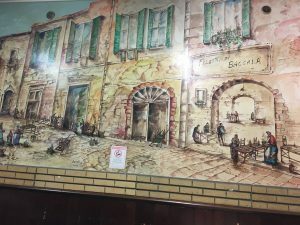 To get a quick bite of food in Rome is possible, though generally unlikely if you are planning to be seated inside a restaurant. 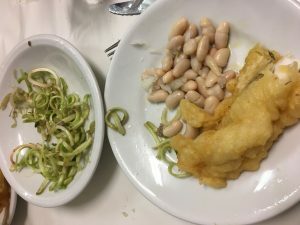 We decided upon a simple dinner, at a wonderful restaurant, Filetti di Baccalà, in the tiny Largo Dei Librari. Baccalà is codfish and is revered in cuisine as a traditional Roman dish. My eyes played over the murals as our waiter led us to a table far in the back. We’d barely been seated when he’d taken our orders and disappeared. Moments later, our table was filled with a graceful gold cloud – three long curving fillets seemed to float on air. Fagioli and curled green beans accompanied the fish. We marveled at the delicacy and lightness of this humble fare. Fortunately, we were also near the kitchen which afforded impressive views of the preparation. If you’ve never tried it before, I highly recommend you try baccalà! Be warned: it may become your favorite “fast food” in Rome! Arriving at the cinema, I shook the drizzle off my umbrella, noticing a gentleman standing guard at the entry to the screening room. “Dieci minuti In ritardo,” he told me as if this was usual. I thought how perfectly Italian that our film started ten minutes late…! The film beautifully traced Nureyev’s hardscrabble beginnings, brilliant talent and especially his imagination. As if spending time in Rome wasn’t moving enough, I felt my heart in my throat and my core gaping open. As I walked home in the night, I thought of my sense of awe and responsibility to share my passion for and belief in forthe power of the arts to illuminate our world.